Wow! What an exciting time! I’m so excited! I’m planning to launch two new Regencies for the kindle this week and I’ve fallen in love with the covers! 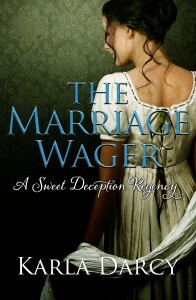 This is a continuation of the Sweet Deception Regencies. All the gentlemen in these books belong to Sweet’s Racing Club. They’ve known each other for years and their lives have intersected in many areas. It’s the women in their lives that have given them the most trouble. The journey to love is a complicated one for each of these men. Used to power and privilege, it baffles, infuriates and confounds them that a mere woman can so upset their well-controlled existence. Jena Christie had been kidnapped by a group of drunken gentlemen, married and deserted on her wedding night. Now her new husband, Lord Havenhurst was refusing to acknowledge their marriage! Convinced his new bride couldn’t hold her own among the ton, Dev proposed a wager that Jena dared not refuse. Neither of them, however, had planned on a wild card called LOVE! Paxton Rutherford, Duke of Ruhaven, takes on the guardianship of Sir Leslie Lathrup, a young boy whose father has died in India. Five years later Pax is appalled to discover his young ward is really a girl and she is sufficiently compromised that only marriage will save both of their reputations. Can Leslie overcome his fury at her deception and win the love of her guardian? Enjoy the new adventures of the men from Sweet’s Racing Club. 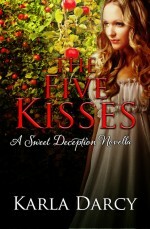 The Marriage Wager and The Scandalous Ward are as much fun to read as The Five Kisses and The Masked Heart. Readers have been very kind in their reviews and I’ve been thrilled at the reception of the first two books. Visit my author page at Amazon to see the full list HERE.